I’ve been looking around the internet, and have noticed a surge in shoes covered in Star Wars images or comic strips. Most of these things don’t actually exist, or exist in a limited quantity. So I thought, “Hey, I can do that!” So I organized a day for my friends and I to get together and make our own awesome geek accessories using decoupage. It’s not something I’ve ever done before, and I thought I’d share what I’ve learned with you. Turns out the Elmer’s glue mix wasn’t quite right. The paper stiffened up and didn’t stay on the shoe when they started moving around and bending. It’s probably perfect for a stationary surface like a box or a table. My next experiment will be with ModPodge, which is a glue specifically designed for decoupaging. I found an inexpensive pair of shoes that fit me at Goodwill. I also found some CrossGen Chronicles comics at Goodwill. 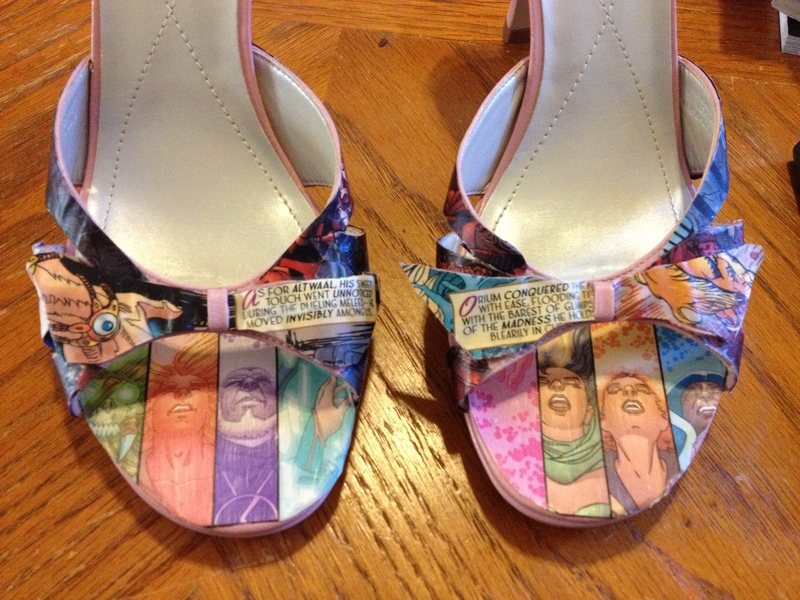 These are the comics I decided to use to decoupage the shoes. After wiping down the shoe inside and out, I started at the toe. I found the perfect piece to go on the exposed toes. I then trimmed the pictures and put a thin layer of ModPodge on the shoe itself, then put down the picture, then put a layer of ModPodge on top of the picture. After the top layer dried, I applied a second coat. I learned that when working with curves, it’s important to make sure the ModPodge is adhering the paper to the shoe. I achieved this by putting more ModPodge on top at the edges where I wanted to be sure it would stay. I also learned that you need to find the natural curve of the paper. Doing something like comics allows for things to be a little hectic and out of order. This allows for more freedom in how you can place the pictures. Also, it’s easier to work with smaller pieces. The bow has been wiped down and is ready for comic application! Next I worked on the heel. Here it is, nice and clean. 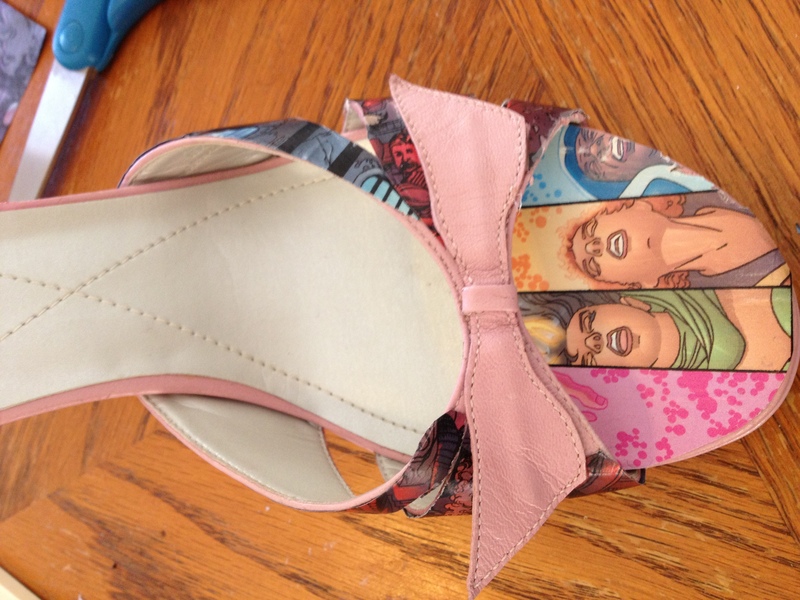 And here’s a heel covered with comics. And the CrossGen logo, of course. I didn’t like the pink, so I used black craft paint to cover it up. And here are the finished shoes! I applied a layer of clear spray paint (satin finish), and two layers of Scotchguard. I used the matte ModPodge, because I like that look better. Too many patent leather shoes for school as a child I think. The only thing I will do differently going forward is to invest in clear coat that’s designed for objects that are flexible. It’s not a big deal with these shoes, since they’re so strappy, but other shoes will be more difficult to get into. I also noticed the application of the ModPodge, spray paint and Scotchguard shrank the shoes slightly across the top. I am unsure if this is because of the non-flexible spray paint, however. Each pair of shoes took about eight hours, start to finish. That includes cutting out the pictures and waiting for glue to dry between coats.